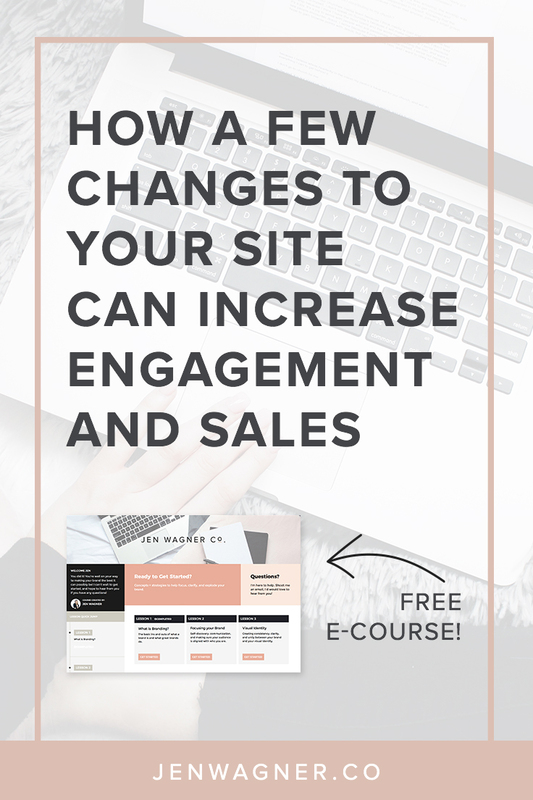 How A Few Changes To Your Site Can Increase Engagement and Sales — Jen Wagner Co.
I’ve redesigned my website at least 3 times over the last couple years, thinking maybe my design needed to be updated as my style transformed and that, hopefully, an updated design would translate to more sales. So, confused and frustrated, I eventually gave up on my site generating any income and it became more of a place for people to come check out who I am. My website had turned into a giant business card and wasn’t generating any revenue. This became an even bigger problem when I decided I wanted to introduce some e-courses to the site. If my website was my only channel for selling those, how on earth would I get anyone to sign up?! People didn’t explore my site because they didn’t understand what I offered them. Let me explain. 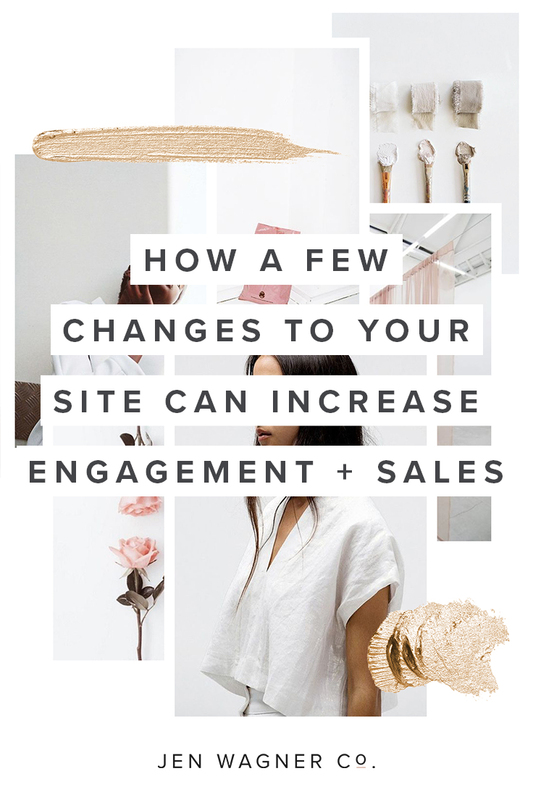 Your website has roughly (and this is no exaggeration) three seconds to communicate exactly what you do and what you’re about to your visitor. Let’s be real, we are lazy! We don’t want to have to look too hard to find the information we’re looking for or information that grabs us. And so if we don’t see it within a few seconds, we click the back button and move on to a site that’s easier to understand. As far as design is concerned, this isn’t bad at all! There’s nothing “wrong” with this homepage when you’re looking in terms of design. But the content is unclear and unfocused. After a three-second glance, what do you think I do? The only semi-obvious thing is that I sell fonts, and even then, the text is so small that it doesn’t grab your attention as a visitor. You have to really look to get information, and that’s just too hard. To fix this, I had to kind of tear my brand apart. I realized that I had never laid necessary foundations, and so my communication couldn’t possibly be clear to visitors. So back to the foundations I went. I believe great design should be easy. It should be accessible and I believe anyone who has a presence on the internet should know how to perform at least basic design functions. The products I sell, then, are not fonts and courses, but knowledge, convenience, and empowerment. Boom. There’s successful removal of all the clutter and a laser focus on why I’m doing everything I’m doing. Now, I have not only something to tell my audience, but something to filter every product, blog, post, etc. through: great design should be easy. From this point, I archived any blog posts that didn’t relate to or help solidify that core belief and changed the language across my site to make it obvious that my desire is to empower and equip my audience to act on that idea. This also creates incredible focus for your brand, making it easier for your audience to know what to expect when they visit your site. 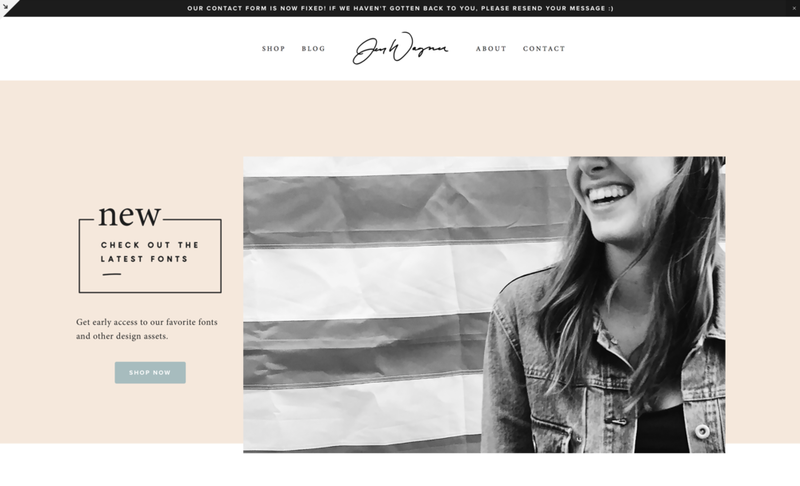 Redo your site so your why is front and center and your visual feel is similar across every channel. This was a time-consuming process for me, but it doesn’t always have to be! For you, it may be changing your big front-page text and making sure your why is clear. For me, it looked more like a total rebrand. When I compared my Instagram profile to my site, I realized that they looked completely different from one another. The color palettes were different, the image styles were different – it was almost unrecognizable as the same company. I realized both of outlets needed some work, so I created a mood board to help give both some direction. 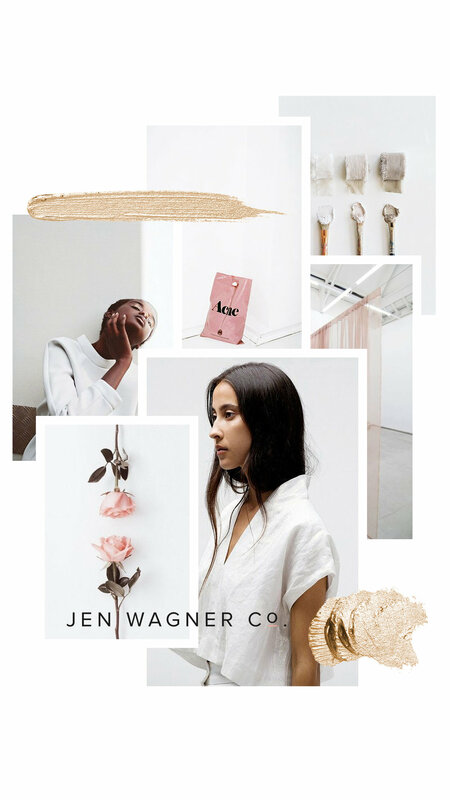 I also used this board to create a color palette for my site and my social media. So there are definitely elements of collage and texture here, and that means that most of my Instagram posts now need to be designed and created in Photoshop. My site also needs to have similar elements so that when people visit my site from Instagram, it’s recognizable as the same company. Now, front and center, people know exactly what I’m about and what I offer them. They also know that they have gone from my Instagram to the correct website because the elements are similar. My header also pushes a button that most of my visitors didn’t know could be pushed – it rallies them to say, “Yeah! Great design SHOULD be easy!” You expose a frustration within them that they didn’t realize was there. And then you offer the solution to their frustration. Capturing your audience’s interest is useless if you have nowhere to send them! There are four different buttons on my homepage that send my audience to a product (free or paid). These buttons are typically brighter colors to help distinguish from other elements on the page. You want your buttons to pop! 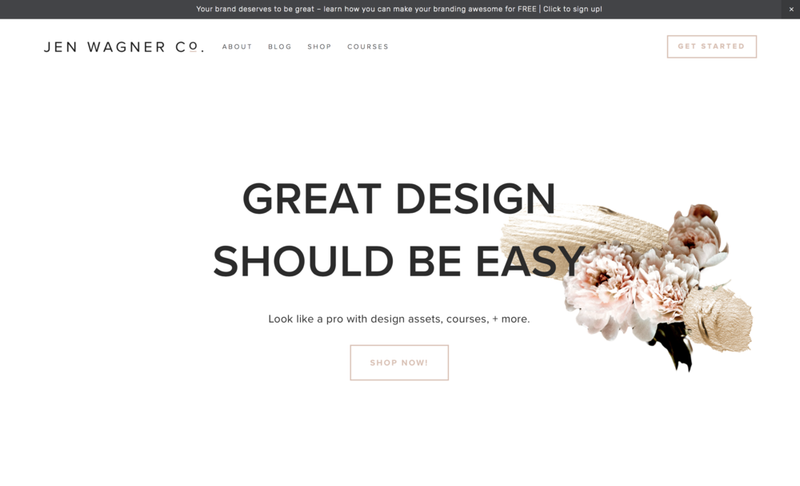 The “Get Started” button in my navigation is also a different color to attract attention and lead people there, where I can give them something awesome for free while building my email list. So figure out where you want your audience to go and find ways to send them there from your homepage (and other popular pages on your site). So! Find your why, put it front and center, stick to a similar look across all your media channels, and take your audience somewhere! Your business – and your audience – will thank you!